Why is ‘Ecco the Dolphin’ on British Pub Signs? At least two English boozers have Boris Vallejo’s iconic art hanging over their doors—but nobody quite knows why. In late January 2017, I caught a tweet being shared between peers in the games press, featuring a photograph of a British pub sign in that had everyone stroking their chin and squinting at least one eye. Naturally, I was curious. Where was this pub? How long had this sign been there? I did a little asking, and a little sniffing about the internet. Turns out that The Dolphin's sign had been on Reddit in September 2014, too, attracting well over 1,000 comments, albeit more about the game than the boozer. Me? I like a beer, and I like video games, so I was curious to know how this crossover had occurred. How this small pub in a historic market town that most people in England wouldn't be able to pinpoint on a map had come by a sign that isn't just based on the cover of Sega's 1993 adventure for the Genesis/Mega Drive, but actually has the very same art on it. That art is by Peruvian painter Boris Vallejo, who also worked on posters for films such as Your Highness and National Lampoon's Vacation, and for the video game Bioshock. You can check out plenty of his work at his website, which he shares with his wife, painter Julie Bell. I asked Boris if he had any idea how his art for Ecco the Dolphin came to be hanging on the side of a pub in Oxfordshire. "I really have no idea," Boris told me. "Sega bought the rights to those pieces. I have not seen them in England, but I have seen them in Venice." I haven't been able to find on-the-internet evidence of said signage, but if anyone's seen it over there in Italy, do let us know. I spoke to landlady Jacqui at The Dolphin, who also didn't know a great deal about the art's actual origins, merely that it was the best of the bunch that the pub was offered. "We were given a choice of several designs, and we chose this one. We didn't know it was from a game until it was pointed out to us afterwards, but we do now get a lot of comments about it." The Dolphin is operated by Greene King, Britain's largest brewer and pub retailer. I've emailed its press office to see if they can shed some light on how the sign came into circulation, as an option for appropriately named public houses. As yet I've received no reply, but should they come back to me with anything pertinent, I'll update this entirely trivial story accordingly. But it's not just Wallingford's Dolphin with the Ecco sign. 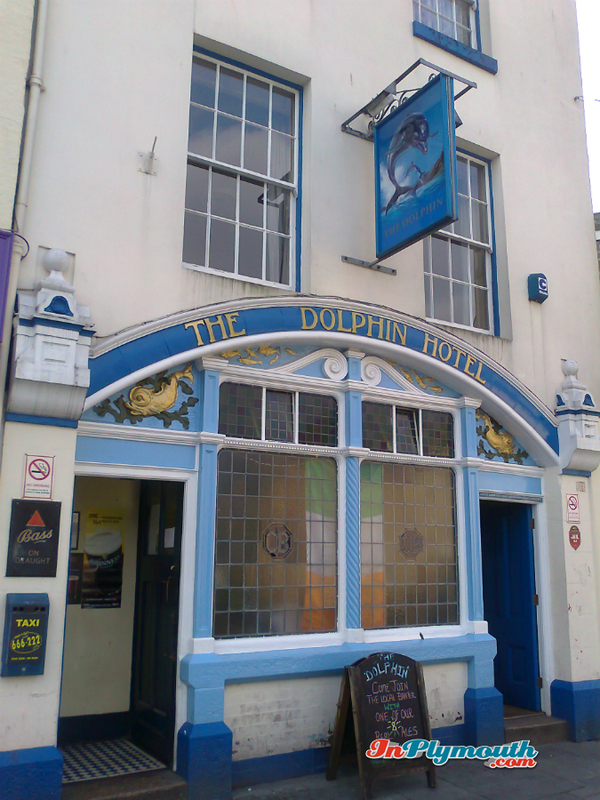 The Dolphin Hotel in Plymouth also has the same leaping-from-the-water image, albeit against a simplified background. (You can see it in this photo on InPlymouth.com, and even clearer on Wikipedia.) The pub, housed in a lovely Grade II-listed building, is now run by Punch Taverns. I called up its manager, Darren, to see if he knew where the sign had come from. "Honestly, I don't know," he told me. "I've been here three years, and it's been here all that time. I've asked Billy who works here, William Holmes his full name is, and he's been here 38 years—the pub's been in his family since 1902. But he can't remember how we came to have that sign. Maybe you could try the local paper, The Herald. They might have something about it in their archives." You know, I think I'll leave the investigative stuff there—after all, this is just a pub sign. An interesting one, though—or, rather, at least a couple of them, as I suspect there must be more examples out there, across Britain and further afield. If you've seen one, give us a shout. Or just have a lovely drink and forget about it. Up to you.